Erin go Blog! Happy St. Patrick's Day! an Ode to MUCK and MAGIC. 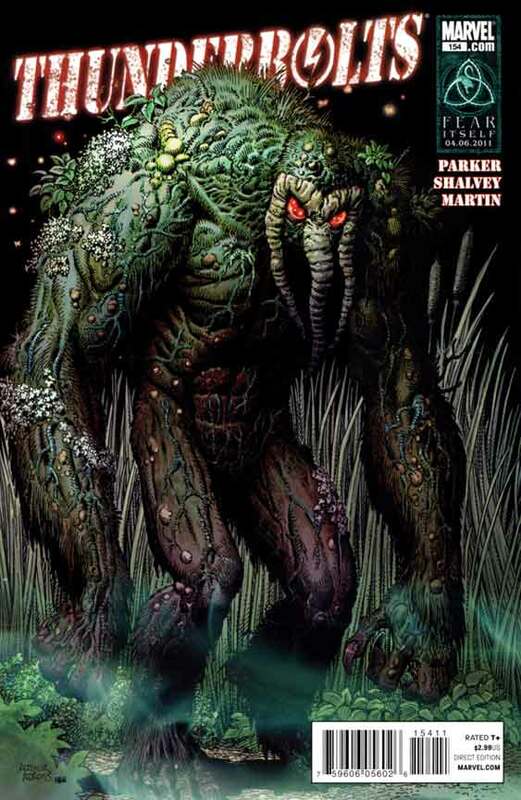 Oft, of late, have I noted my absolute love of, and devotion to, the works of Jeff Parker - especially as far as his handling of the MAN-THING; both without and within the pages of the THUNDERBOLTS. I glowed, and showered praise upon his (and artist Colleen Coover's) brief, touching glimpses of Man-Thing's deeply hidden humanity and endearing nature in 'X-MEN : FIRST CLASS : FINALS' [HERE]. I lavished heaping spoonfuls of love on the prospect of Parker using Man-Thing in the Thunderbolts [HERE]. And I awarded Parker and Thunderbolts with golden "SANCTY's" - during the 2010 installment of my annual "SANCTUM AWARDS" [HERE]. 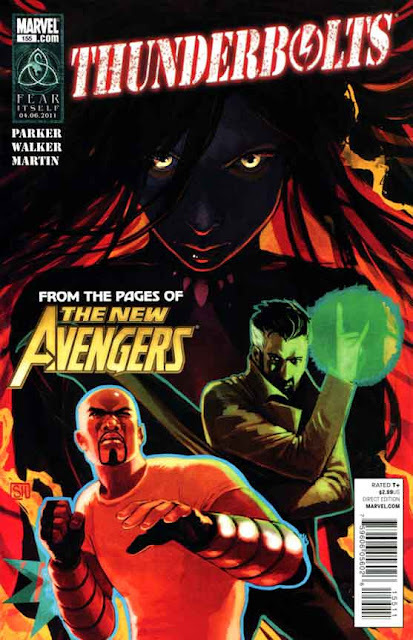 So, as I mentioned in passing in my most previous post, I am due to shower MUCH LOVE on Jeff Parker and his latest few issues of THUNDERBOLTS (# 154, 155) - not JUST for the awesome treatment he has shown Man-Thing, but also for the amazing, deft and insightful treatment he showed to Doctor Strange in the latest issue (# 155). 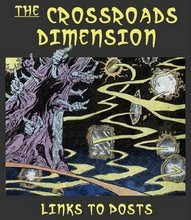 Behind a sweet cover by Arthur Adams, issue # 154 bridges the question most obvious to any fan of Man-Thing (and it was the first thing this reader wondered about when hearing of the plan to turn Manny into a team player)... "As guardian of the Nexus of All-Realities, can Man-Thing be away from that post for long?" 1) Because he "refused" to register for the 50-state Initiative. 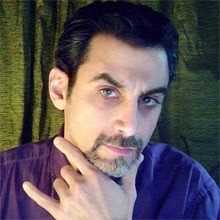 2) He is known to have caused the deaths of many people in Florida over the years. At the start of the issue, the story alternates between a team of Government bureaucrats who, thinking that Man-Thing is too dangerous to be used as a field agent, seek to have him removed... and scenes from the Florida swamp, where a wave of other-dimensional invaders (the hunters of Vellus-Kar) have emerged only to hunt and kill many native Indians. So, long-time friend-of-Manny; Jennifer Kale - sorceress, High-Priestess of Zhered-Na, and some-time apprentice of Doctor Strange - seeks to rescue Man-Thing from his incarceration (and perceived indentured servitude) by returning him to the Florida swamp from whence he came. This is so that he may continue to satisfy his role as Guardian of the Nexus, in this case, to put to rout the invaders and preserve the boundaries of our world. However, once the danger has been eliminated, Man-Thing uses his teleporting ability to return to the Thunderbolts - ostensibly because... he wants to. Thus, he is not a true prisoner at all, but a potentially willing participant. This new desire to be among "humanity" (or at least other pseudo-monsters) is alluded to as perhaps starting during Man-Thing's time spent with the new "Legion of Monsters" (in the pages of Punisher / FrankenCastle and Marvel Zombies v3 and v4). His time spent among those of his own kind seems to have touched upon the spark of consciousness that Jeff Parker has been stoking in his treatments of Manny over the past few years. In the issue, Jeff Parker shows the true import of the Man-Thing's role as protector, but gives Manny, and us, a desire to continue with the new life opportunities presented by staying with "friends" in the Thunderbolts. 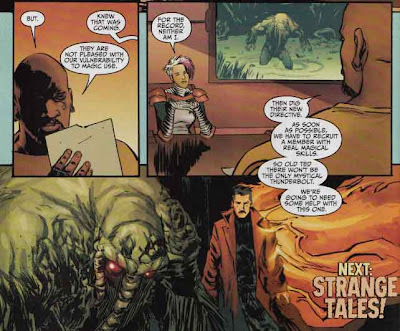 Parker also seamlessly give a 2-panel origin recap, because it seems that not all of the Thunderbolts are aware of Man-Thing's former human identity as Ted Sallis, and gives long-time mystic nomad; Jennifer Kale a new mission; that of the temporary new Guardian of the Nexus until the Nexus grows a new one. Along the way, we are also given another look into the custom-tailored habitat which was constructed for Man-Thing, and we meet Dennis; one of the "swamp-keepers", a zoologist / botanist whom, after being burned by Man-Thing, still strives to care for the needs of the unique life-form. As any true animal-lover or animal behaviorist will attest, you can't get angry or blame the beasts for behaving true to their nature. It isn't the shark's fault for eating things that bleed into their waters, it isn't the lion's fault for mauling whomever wanders into its space. It isn't the Man-Thing's fault for burning you if you don't understand it - and feel fear. While Declan Shalvey, the artist for the issue, excels in the swamp scenes and any panel where Man-Thing appears, the rest of the issue seems, at times, to be a bit stiff. Helping to keep the quality high, the colors by Frank Martin lend a sense of depth and dynamism to every scene. Sadly, in the issue Ms. Kale is not dressed in her old metal-bra and g-string sorceress garb, but the new, unflattering, bland and masculine Initiative uniform. This is not the fault of the artistic team, since the new uniform that Jen wears seems to be her new look (since Marvel Zombies v3 - or v4). The issue ends with Man-Thing given a passing grade by the Government agents, who, after seeing him in action, and witnessing his willing return to the facility, decide that he is a valuable asset. 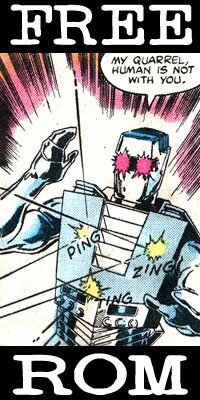 The NEXT Issue (# 155) can perhaps be nominated as a contender for my all-time favorite comic book. At least my all-time favorite that teams Man-Thing with Doctor Strange (and yes, there have been several others over the years). * Sadly, Part I of the post was written more than a week ago, but I was hoping to post both parts as ONE entry, so I postponed posting this until it became obvious that I wouldn't be able to post part two for a few more days. I've been working "double-shifts" quite a bit as of late. However, I need to get some sleep because I'm going away for the weekend, and I KNOW that I'll be expending a ton of energy, since I'll be in the company of my brood-mates and their kids (my nephews - whom I know will insist on a lot of Uncle Ptor's attentions). If I don't get rest a.s.a.p., I fear I may become succeptible to falling ill - just in time for another grueling week. - A special project that I have wanted to unveil here for MONTHS. But before all that, I needs me some rest. So, it is time to cast a sleep spell. This spell creates mists that act like the Vapors — Sleep spell when used on others, but is different when self-induced. When used on himself the mists puts the user in a deep sleep for a few hours that provides all of the sleep requirements necessary for three days of normal activity. Needless to say this can be dangerous for some mystics as the sleeper is extremely vulnerable to attack. 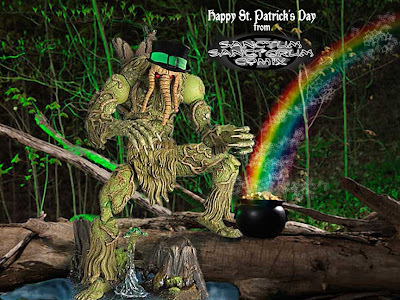 Just a quick note to say "Happy St. Patrick's Day" to you all. Yes, I am reusing this image from last year. Sorry, but I'm crazy-busy at the moment and recycling is the "green" thing to do. 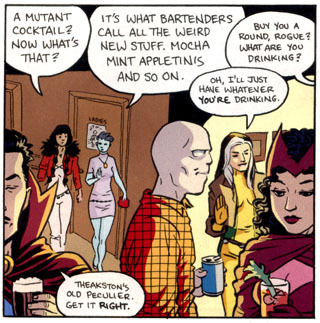 As an added bonus, here's a scene of Doctor Strange bellying up to the bar and ordering a Theakston’s Old Peculier. BEWARE : The IDES of MARCH! The infamous "Ides of March" (Google it if your history class never went over Ancient Rome and the life of Julius Caesar). But it is ALSO the day that the Downloadable characters are made available for the newly released MARVEL vs CAPCOM3 video game (as blogged previously [HERE]). Man-Thing appears at the end of JILL VALENTINE's story (she being another DLC character). Man-Thing and the Legion of Monsters (Morbius; Living Vampire, Werewolf by Night and Living Mummy). And at the ending for Hsien-Ko, DOCTOR STRANGE is summoned... sorta. Sadly, it seems as if it isn't REALLY Doctor Strange at all, but an imagined version created by Hsien-Ko in a comic book she created. The Ides of March have struck again. 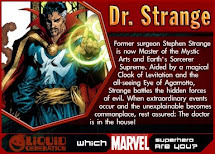 Once again the respect for Doctor Strange, by the very company he keeps, has been assassinated. No, sadly, I have YET to even look at the game itself. First off, as I mentioned in the original post [HERE] I don't even own the required video gaming system with which to play the game. As well as the sweet Shuma Gorath limited edition t-shirt that came with it. But, also, I've been so busy with professional projects; called in to work on special projects at my most recent employer, as well as freelance projects for my ex-employer-before-that. AND two special projects that will be revealed on this blog (which should have been revealed already if not for the aforementioned business keeping me busy). However, and this wraps up all these points; I am expecting to play this game this coming weekend with my brother - who owns multiple game platforms (my first "official time-off" in a long time, as I will spend time with all of my siblings for a weekend getaway). Some down-time is required to recharge. Then, I'll get to post all the entries that have been waiting in the wings these past months.